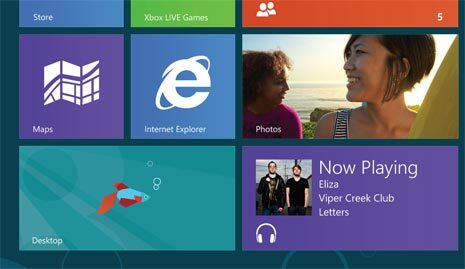 Windows 8 is next version of Windows operating system. Besides additional goodies, it carry forward all the goodness and stability of Windows 7 operating system. 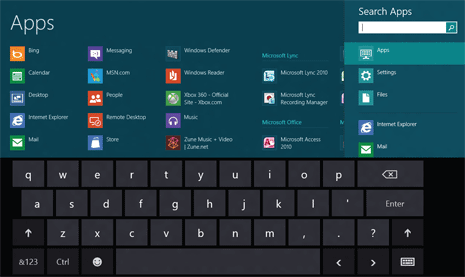 You can use the traditional desktop interface along with new touch gesture supported metro style user interface. Also, you can extend functionality and perform specific tasks in a better manner by installing respective apps from Windows Store. With touch support, Windows 8 will find home on tablets and touch based devices besides usual laptops and desktop PCs. Windows 8 bring lot of possibilities of expanding Windows experience in right direction. Here are few Windows 8 features you should know for the start. Windows 8 has all new start screen design which can be easily described as radical for a loyal Windows user. Metro style start screen has everything you need at one place like contacts, calendar, weather, apps and much more. Tiles on start screen show updated real time content so that you never miss any update. Besides the new, Windows 8 also has all the vintage goodness of Windows 7 desktop screen. You can easily switch to old style desktop interface that display icons on desktop screen and taskbar at the bottom. The old style desktop interface or new metro style interface – both are available on Windows 8 for you to choose and use. Traditionally, we have been using and working on Windows using combination of mouse and keyboard. Now with new Metro style tiled interface, you can perform same tasks more quickly and easily using touch gestures (like we do iPad and other touch enabled tablet devices). You can use quick touch gestures to navigate and use various elements. It also features full sized touch keyboard for easy typing. With touch interface, Windows 8 has wider usability of being used on tablets and touch enabled devices – besides the usual laptops and desktop computers. Windows 8 comes pre-loaded with number of apps for various tasks (with possibility of downloading more apps as per requirement). 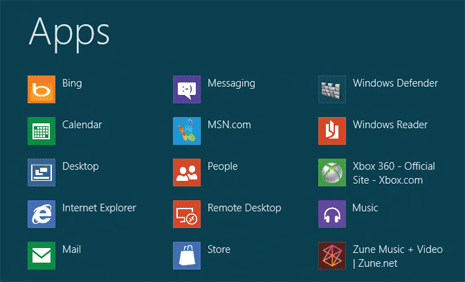 With Windows 8, your PC is cloud connected with quick accessibility to Apps for variety of tasks. You will have new Mail, Calendar, Microsoft SkyDrive, Photos, People, and Messaging apps that are connected to the services you use, just by adding them to your Microsoft account. 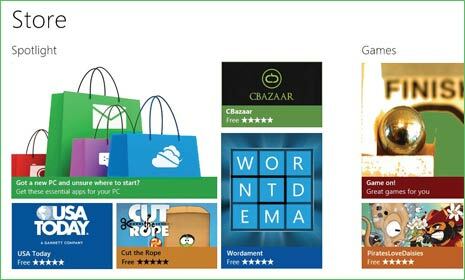 Besides pre-loaded apps, Windows 8 provides access to dedicated Windows Store featuring variety of Apps. You can browse and download apps of different type like games, utilities, news and much more. From user point of view, this provide more easy ways to extend functionality and use of Windows 8 operating system. Just like Apple’s app store – Windows Store should have huge listing of free and paid apps over period of time. If your current laptop or desktop PC is running Windows 7, you can simply install Windows 8 operating system on it. Windows 8 does not require any additional hardware requirements to install and run. Also, power requirements of Windows 8 are at lower end. Hence, it should run for longer time on single battery charge on your laptop and other portable devices. With low power requirements, data transfer is faster and Bluetooth delivers low power wireless connectivity for longer battery life. tabs and navigation controls appear and vanish way when you do not need them. 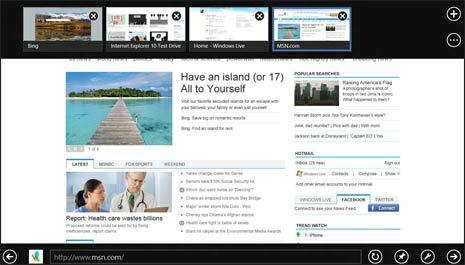 Internet Explorer 10 promises more faster and safer internet browsing. It also comes equipped with support for latest web technologies like HTML5, CSS3 and EcmaScript5. Want to Download & try Windows 8 now? Microsoft has released beta version of Windows 8 (also called Windows 8 Consumer Preview). You can download 32 bit and 64 bit version of Windows 8 or use this webpage to download Windows 8 beta in different language. Once you download, you can use DNJXJ-7XBW8-2378T-X22TX-BKG7J product key to activate Windows 8 consumer preview for the test drive. I think classic PC users will be disappointed with this OS it’s more useful to touch interface…i personally used it in my computer when the developer preview arrived in internet .This OS will be a failure just like windows Vista….